The manuscript also contains Paul the Deacon's 'History of the Lombards'. Written in the late 8th century, it is an important account of one of the early medieval Germanic kingdoms. Like most other early medieval histories, it combines a factual narrative with ancient myths and stories of popular traditions. This page has the end of the list of chapters for Book 6, followed by the beginning of Book 6 (at the large 'C'). 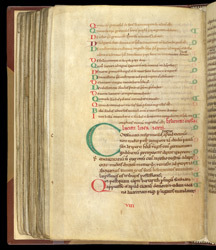 Each section begins with a large coloured letter, added after the main text had been copied. In the left margin, the small letters 'c' and 'q' are guide letters, written to aid the rubricator or specialised painter who created the coloured letters. In the lower margin, the roman numeral 'VIII' is a mistake: it should have been 'VI', for Book VI.